I was at a lecture last week in Trinity College Dublin given by Professor Robert Winston. Winston and his team in Imperial College have pioneered a number of innovations in IVF and related fertility treatments. One of his charts related to the trend in the rising average age of mothers at birth of first child. This in turn has contributed to some of the fertility problems that Winston and others are now dealing with. 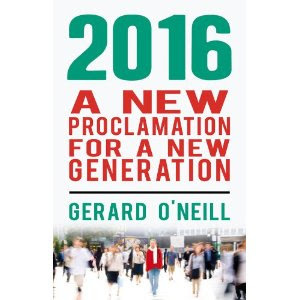 His was UK data, so I was curious to establish whether we have had a similar trend in Ireland. 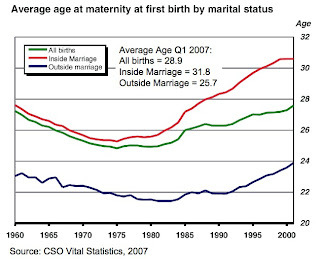 Sure enough, as the chart from the CSO shows, we have undergone a similar demographic transformation, especially for married women. Back in the mid-1970s a married woman in Ireland was likely to have her first child about the age of 25. By early 2007 the average had risen to nearly 32 years of age. Winston's talk was organised by TILDA - The Irish Longitudinal Study of Ageing. The TILDA initiative will play a vital part in understanding how demographic changes such as those highlighted by Professor Winston will affect Irish society in the decades to come. Though sometimes discussions about ageing can lead to a fairly gloomy outlook in relation to health and other issues, it is reassuring to know that growing older is actually associated with increased happiness rather than the reverse! According to a recent 55 country comparison by David Blanchflower and Andrew Oswald, happiness is distributed 'U-Shape' by age: middle age is miserable, whereas youth and older age are much happier. The 'trough' in average happiness in Ireland is reached at 50.3 years precisely: a lot older than in Australia (40.2 years of age), but much younger than in France (61.9 years of age).